Life is too short to spend hours a day wrangling invoices manually, and trying to collate timesheet data into a figure that will leave you in the black. There has to be a better way - and there is. Read this chapter and learn how to streamline your entire invoicing process. Not only will you get paid faster - you’ll have more time for the good things in life! Imagine this... An enthusiastic young entrepreneur named James has launched his first consulting business. He’s a digital marketing whizz with great ideas, and he soon has clients rolling in. Everything is going smoothly. He’s keeping on top of jobs and is feeling positive. James has 10 client jobs the first few months, but it soon jumps to 25. Then 50. Suddenly everything starts to spiral out of control. James had been keeping track of his jobs and invoices in a manual spreadsheet, but this soon becomes impossible. He struggles to generate invoice numbers and sometimes forgets to send them at all. He becomes so overwhelmed by these administrative tasks the quality of his work starts to drop, and he loses many of his original clients. Things aren’t looking so good after all! To make things worse, his clients aren’t in a rush to pay his manually sent invoices. When they do pay it’s often late. And when they don’t, he has trouble remembering when to send an email reminder. James starts to wonder if any of this stress was even worth it. Sound familiar? James should have started using an online invoicing software from the moment he got into business. But don’t worry...if you’re still doing you’re invoicing manually, it’s never too late to make the switch. Here are some of the biggest advantages of doing your invoicing in the cloud. The benefits of online invoicing with the cloud are numerous - and you may already know them - so feel free to jump to the next section if you’re already convinced! It’s faster. With almost any cloud invoicing system you’ll save time - sometimes several hours a day - because you’re not fiddling with manual invoicing. It’s more accurate. Most cloud based invoicing software helps you to calculate billable hours, VAT, currency rates, etc. This greatly reduces the chance of human error. You can schedule repeating invoices. If you have clients you invoice every month, systems like WorkflowMax let you set up automatically recurring invoices. The time-saving potential here is obvious. It’s easier for clients to pay you. By including online banking details or even a pay now button, you’re much more likely to get paid on time. You look more professional. Most online invoicing software lets you create invoice templates which can be customised to reflect your brand. Your information won’t get lost. Paper invoices can disappear or slip through the cracks. Invoicing in the cloud means you can access all invoice information - old and new - with the click of a button. You’ll save a great deal of stress at tax time! By having all your previous invoices and critical information at your fingertips, you can file taxes easily. Invoicing is one of the best parts of doing business - the part where you get paid. But a clunky system can cause massive headaches and hours of time lost on administration. There are thousands of options for your online invoicing system, but your decision will depend on your small business management needs. For most small businesses Xero accounting software is a great tool. If your business charges based on billable time, WorkflowMax could be an ideal fit for you. WorkflowMax (a Xero owned product) is a powerful all-in-one system for job management, time tracking, quoting, reporting and invoicing. Our cloud based software integrates seamlessly with Xero, creating a complete small business management solution. Many business owners use both Xero and WorkflowMax manage their jobs and payments. The two systems integrate seamlessly to maximise your small business invoicing experience. Seamless Integration. Push invoices from WorkflowMax through to Xero at the click of a button. Payments in Xero are signed off in WorkflowMax automatically. Flexibility. Choose from a wide range of options in WorkflowMax to determine how invoices are calculated. Edit staff, job and task rates as needed. The Brand Factor. Get your invoice looking exactly the way you want in WorkflowMax - add your logo, payment terms or any optional extras. Powerful Insights. Get an accurate view of your business profitability as purchase orders, invoices, and payments move between Xero & WorkflowMax. Professionalism, branding and consistency are important. 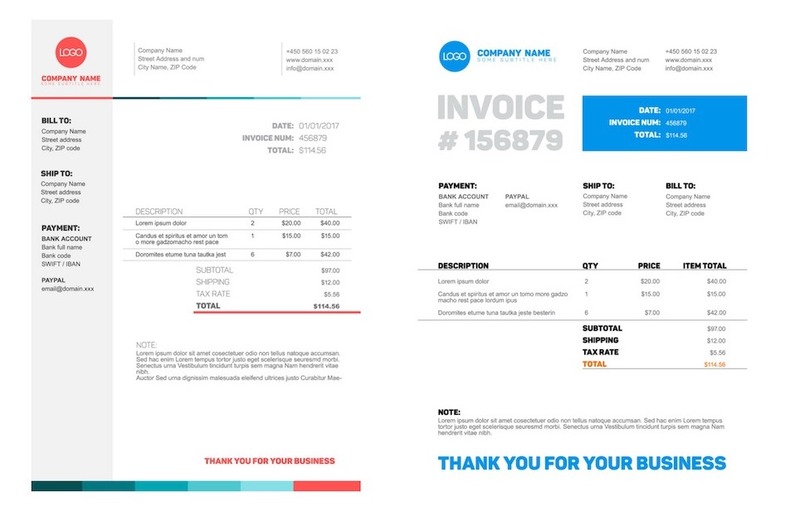 Your invoice should leave a lasting positive impression on your client. It should also make it as easy as possible for them to pay; so they’re not reaching for their glasses to decipher your tiny print. With small business invoicing software, you can use customisable templates to create invoices that look exactly the way you want. Use the custom template builder to add your own logo, branding, payment terms and optional extras. Save custom templates for future use, then send gorgeous invoices in a matter of minutes. A word of warning - branded colours and creative design are great when creating invoices for small business, but make sure the document is still easily understandable. Opt for a decent amount of whitespace and ensure that all figures are readable. You don’t want excessive graphics, watermarks or colourful fonts covering every inch of the page. Designer Mallory McMorrow has done an excellent comparison of invoices, in How to Design a Killer Invoice That Reflects Your Style. Your invoice isn’t just for chasing payments; it’s a chance to show gratitude to your client. It's their money that's supporting your business and dreams. Use your invoice as an opportunity to thank every client. I recommend including a brief sentence in the invoice template so it’s never forgotten. It doesn’t need to be elaborate - a simple “Thank you, we appreciate your business” goes a long way. For extra special clients you can add a personalised note, or send a gift. Seems like a no-brainer, doesn’t it? The whole point of small business invoicing is to get paid…But you’d be surprised how many people fail to include payment terms on their invoice. They either leave off a due date (relying on good faith that the client will pay in time), or they leave out crucial information like banking or preferred currency. For this reason we strongly recommend setting a due date and displaying it clearly on your invoice. You are entitled to set payment terms for your invoices to suit you. It’s no longer a given that you should have to wait 30 days for a payment or wait until the 20th of the month. For online payments a 7-day term is usually reasonable. Be clear about due dates, late fees, how payments should be made. How can I get paid by clients faster? It’s the question on every business owners lips! How can you get your small business invoicing done quicker to ensure a healthy cashflow? This is especially important when you’re a small business in a high growth phase. Unlike larger, more established firms your expenses are rocketing and you’re dependent on speedy invoicing to keep yourself afloat. Luckily there are a few ways to speed up and streamline your whole invoicing process. This will not only save you time; but make your clients likely to pay you quicker. We’ll start with the obvious. Don’t do your small business invoicing a month after work is completed, a week, or even 2 days… Send your invoices immediately! With a remote invoicing software and mobile app you can fire off an invoice as you’re literally leaving the job site. Or depending on the project, you might want to invoice while the job is still in progress. This ensues you’re not waiting too long for payment, and gives you leverage if the client tries to back out of the project. You are entitled to set payment terms for your invoices to suit you. It’s no longer a given that you should have to wait 30 days for a payment or wait until the the 20th of the month. Instead, outlining a 7-day payment term is perfectly reasonable. Be very explicit with your clients about your terms, both when you provide them with a project pitch, and when you send your invoice. You may also require a deposit or split payments throughout the life of the project. This is especially important for high-value projects, and gets a financial commitment from your client that they will meet their side of the deal. You’ve put so much work into branding your business - why skip this when it comes to invoicing? Every invoice you send should be a reflection of your brand personality. It needs to be professional, clean and easy to read; with your company logo, on-brand fonts and hopefully a few other distinguishing features. But above all you should be consistent! And the best way to ensure invoice consistency is with custom invoice templates. Creating small business invoicing templates can save you hours of time. Just set it up the way you want to look, add your logo and personal branding, and then later you can send them with the click of a button. Here’s a brief guide to setting up custom templates in WorkflowMax. Many types of online invoicing software have search filters which help you sort important information. This means you can quickly view all invoices for a specific client, or sort them by account manager. Learning to use these filters can save you hours of time when analysing and following up invoices. In WorkflowMax, the filter contains at least one ‘condition statement’ which is used to match information in your database. You can read specific instructions for using WorkflowMax search filters here. By using these strategically you can speed up your whole process. One of the most important things when running a business is clear communication. But when you’re juggling multiple jobs, staff members, clients and stakeholders - things can get a little crazy. How do you know when something’s been updated, or how far a job has progressed? And many more options. Setting up these alerts will send you both an in-app notification and an email (although you can turn email off if desired). Set them to notify the relevant people and keep everyone in the loop. By using alerts and notifications strategically, you’ll always know the status of a project. This means you can address any problems or roadblocks immediately, and in turn send invoices and get paid faster. Do you have clients you bill for the same work and price regularly (e.g. every week or month)? By setting up recurring invoices you could save yourself a huge amount of time. Instead of generating those repeat invoices manually each month, have them send automatically. This can save you a huge amount of time and stress, and help ensure a regular cashflow. You can read more about recurring invoices in WorkflowMax by visiting our help centre. If you don’t like the idea of late payment fees (some owners worry this may damage their client relationships) you can do the opposite. Have an early payment incentive specified on your invoice - e.g. 5% discount when paid within 7 days. You’d be surprised at the impact even a small incentive can have. This may not work for very large jobs or when cashflow is tight - so weigh up the costs and benefits for your company. Ahhh...the unpaid invoice. It’s something every business owner dreads. But these overdue payments have to be chased, otherwise you’re leaving yourself out of pocket. Even small amounts and delays can quickly pile up and destabilise your cashflow. No one wants to have the awkward “where’s my money” conversation, but luckily there are ways of smoothing out the process (and sometimes you can avoid confrontation completely!). The easiest way to chase unpaid invoices is with automatic email reminders. Asking for an overdue payment tends to make both parties feel uncomfortable. The client may feel embarrassed, especially if they keep forgetting to pay. Or they may get the impression that you don’t trust them. That’s why automated email reminders are a great way to chase invoices - they’re not personal. You can continue emailing your client directly about the project and other nice things, while ‘the system’ reminds them about awkward issues like their neglected payment. Both you and the client get to save face. With online invoicing software like WorkflowMax you can set up custom email reminders to be sent to the client a certain number of days after the invoice is sent. Automated email invoice reminders also save you a lot of time, and ensure you’ll never forget to chase a payment. When your emails go repeatedly ignored (or your cashflow is in dire straits) it’s time to pick up the phone. Many business owners dread doing this - it’s normal to feel shy or overwhelmed. But it’s important that you take this next step when payments become unreasonably delayed, or you feel like the client might be taking advantage of you. Of course, since a phone call is much more direct than an email, it’s important you go about this tactfully. Otherwise you may damage your relationship with the client for good. Have a script to refer to.You’ll feel calmer and better equipped if you know exactly what you’re going to say. This also means you won’t leave out any important details. Be friendly & polite.There’s still a chance they’ve missed your emails, or simply forgotten to pay. Give them the benefit of the doubt when you call for the first time. Ask if there’s anything you can do.They might have misplaced your details or need the invoice re-sent. In some cases you might want to renegotiate payments terms - e.g. offer a split payment plan if they’re struggling financially. Even at this point aggression is not going to help your situation. Be polite, but very clear about what is required of them at this point, and emphasise the consequences of non-payment. Give them an ultimatum.If the client’s payment is seriously overdue, tell them you can’t continue to work on this or their future projects until it’s fulfilled. If worst comes to worst (emails and phone calls go ignored, and you’ve passed the 60 day mark) you may have to go to a debt collection agency. Always give the client one last chance to pay before this. Let them know the exact date you will be forced to take action. In rare circumstances, you may have to give up completely. This can happen when the costs of obtaining payment (e.g. legal fees or debt collectors) outweigh the bill itself. Or when it’s simply too far gone. If you have to cut your losses, at least you’ll know not to work with this client in the future. Lesson learned! Don’t get angry or emotional.9 times out of 10 a payment is late because they’ve simply forgotten or are disorganised. Losing your temper will only make things worse. Never air your grievances on social media...Or in any public forum. This can damage your business image, and scare future clients away. At worst it could result in legal action from the client. Don’t work for a client again if they’ve been difficult. If it took you months of emails and phone calls to squeeze payment from them, you may want to blacklist them. Chasing late invoice payments is one thing. Invoice disputes are another beast entirely! Unfortunately, most business owners will deal with a disputed invoice at some point. It can happen because your client doesn’t like the completed work, fees were added they didn’t anticipate, or they just don’t have the money and are trying to find an escape. Whatever happens, don’t assume the worst straight away. It’s possible they have a valid reason for disputing the invoice. Keep your cool and pick up the phone for a direct and professional discussion. If the invoice is itemised, talk directly with your client and go through each item on the list. Often it’s not the whole invoice they’re unhappy with - just a particular deliverable. Maybe they think a certain part of the project wasn’t up to standard, or they think you’ve added an item without their consent. If this is the case, kindly ask them pay the rest of the invoice while you resolve the disputed item. At least you’ll get a partial payment - which is better than the whole invoice remaining disputed for an unknown length of time! Here’s a handy list of scripts to use when calling clients about invoice disputes. Even though invoicing is one of the most important parts of doing business, there are many common mistakes small businesses make, even when invoicing online. Online invoicing software is an awesome tool - but only if you know how to use it. You might be tempted to teach one staff member your invoicing software and leave them to it. But what happens when your invoicing star falls sick? What if she takes a last minute holiday, or worse still resigns? Invoicing is a critical part of your business and you don’t want to find yourself playing catch-up at the last minute. It’s a good idea to train several employees in the use of your chosen software so you don’t get caught out. Many business owners feel uncomfortable about demanding quick payment, because they don’t want to seem pushy. Small business owners and freelancers are especially prone to feeling guilty when charging for their time. Because of these misplaced feelings of guilt - or their desire to preserve an amicable client relationship - many people don’t include a strict payment date on their invoice. They simply trust in the client’s goodwill, or offer them an extravagantly long settlement period. This is a big mistake. Even if you do a brilliant job for your client, invoices that don’t appear urgent will usually drift to the bottom of their to-do list. Instead keep your payment deadline tight (within 7 days is standard online) and clearly specified on all your invoice templates. Make sure to explain any late fees on the invoice as well. How do you accept payments? What are your payment terms? Can the client pay online? Do they have to mail a cheque? Should they spin around three times and say a magical incantation? A confused client = delayed payments. So make sure your invoice contains crystal clear instructions. You should also make sending money as easy as possible. Accept direct deposits into your bank account, and write your account number on your invoice. We’re all human and mistakes do happen - even when you’re using online invoicing software. But messing up the name or details of a client can be insulting, especially if you’ve worked with them for a long time. At the very least you risk looking incompetent or inattentive. And if you get an email address wrong (or use an old one) they might not receive your invoice at all! Email bounce-backs are a big source of delays and frustration. Mistakes or incorrect details can also cause your client problems when tax season comes. Then you can definitely kiss any return business goodbye. So how do you avoid this deadly sin? There’s no foolproof way to avoid human error, but using an end-to-end project management system can help. Triple check all client details when you enter them the first time - then use the system to automatically populate your quotes and invoices with accurate data. This will greatly reduce your chance of error! That concludes our chapter about small business invoicing and getting paid faster. Of course, another crucial aspect of client management is keeping them around for return business. Learn everything you need to know about Client Retention in the upcoming Chapter 6!